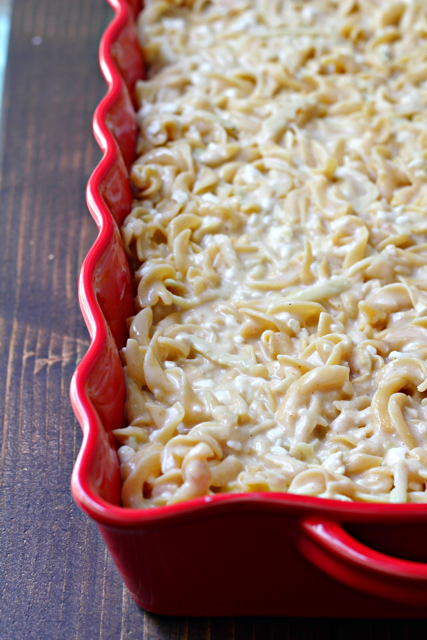 The kugel of all kugels. 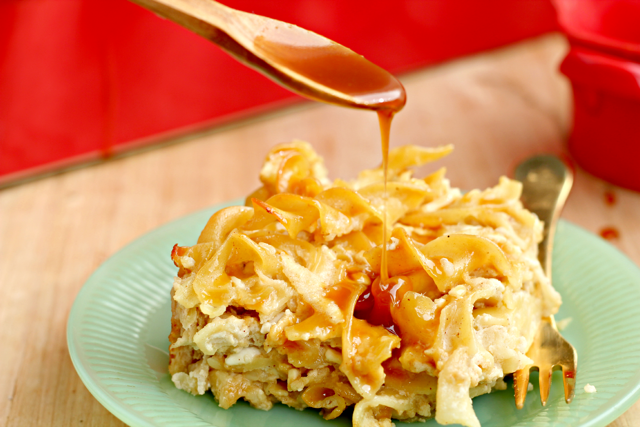 With tart apples and a sweet caramel drizzle, make this Caramel Apple Kugel for Rosh Hashanah and be prepared not to have leftovers!! 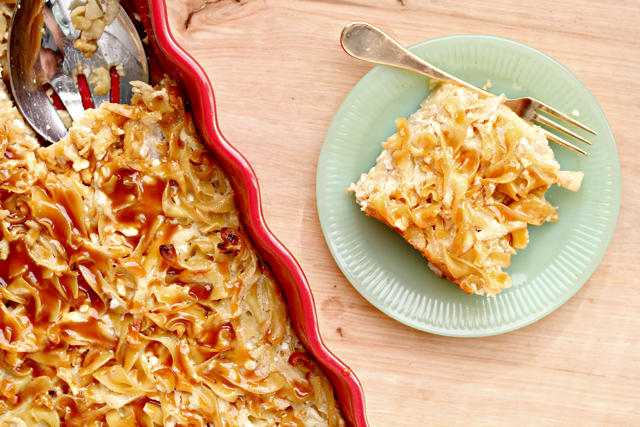 I’m not going to tell you that this Caramel Apple Kugel will change your life. But I think the results speak for themselves. I have had two marriage proposals from lucky recipe testers who tried this dish. One was even from a very eligible straight man. It’s that good. 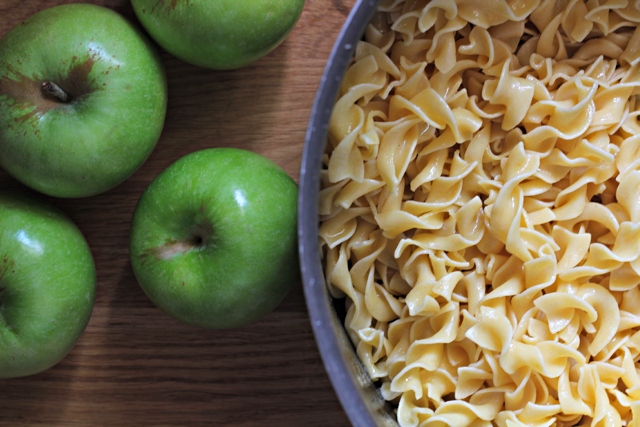 Shredded apples add a slightly tart flavor, with the creamy filling, and buttery noodles, it’s pretty much irresistible. 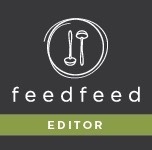 This past weekend, I was in Seattle for the IFBC Conference. There were lots of good eats, which I’ll share with you soon. 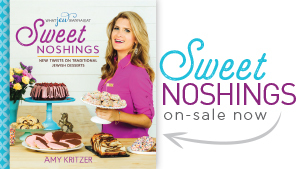 But now that I’m back, it’s all about the Jew Year noshes. Here is one little hint. Beet sushi! Back to the kugel. This was already tasty, but then I went ahead and added a homemade caramel topping. It melts into the nooks and crannies creating little pockets of sweet awesomeness. I love surprises- especially when they are made from sugar. Check out that action shot. Hashtag drooling. 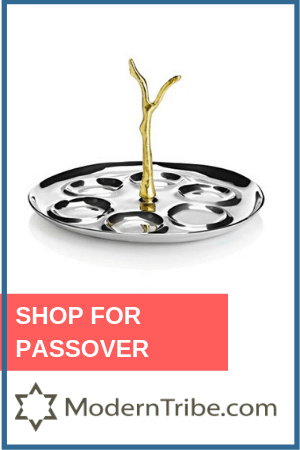 Serve this kugel warm, at room temperature, or straight out of the pan at midnight lit only by the glow of the refrigerator. It’s good all those ways! I suggest topping the each individual piece with more caramel. Because why not? 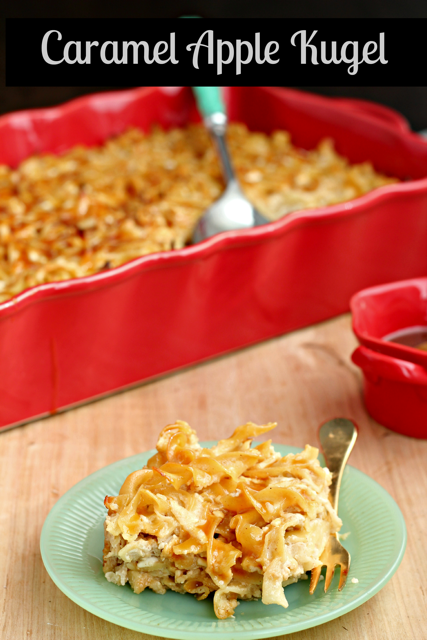 And make sure to come back tomorrow when I post a video of me on Studio 512 Austin making this kugel! Yay. The kugel of all kugels. With tart apples and a sweet caramel drizzle, make this for Rosh Hashanah and be prepared not to have leftovers!! Butter a 13 by 9 by 2 inch glass or ceramic dish and set aside. 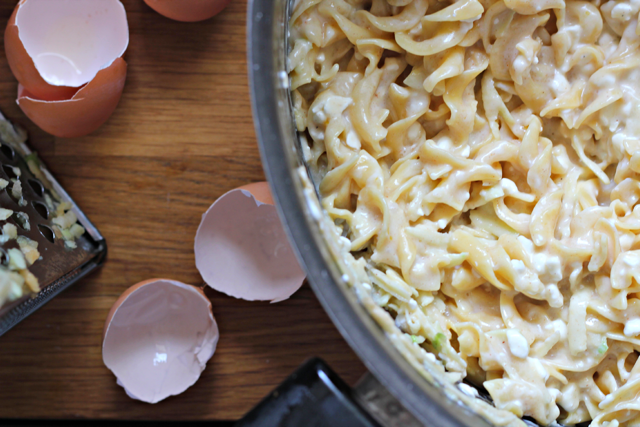 Cook noodles in large stockpot in salted water according to directions until al dente. Drain well, then return to the pot and add butter, totally coating the noodles. In a large separate bowl, peel and shred apples and dry well with paper towels. Add in milk, eggs, sugar, vanilla, cinnamon and salt. Mix well and add in sour cream and cottage cheese. 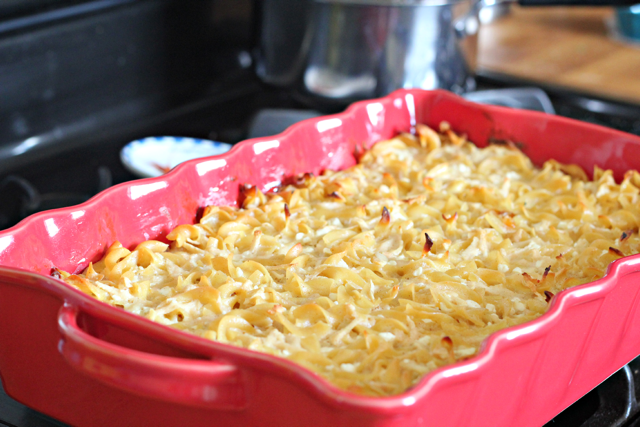 Bake kugel for 1 hour until golden brown. While kugel is cooking, making caramel sauce. Melt sugar in a small saucepan over medium-low heat until sugar just starts to brown. Add in butter and whisk until butter melts and sugar dissolves, about 30 seconds. Remove from heat and whisk in heavy cream and salt. 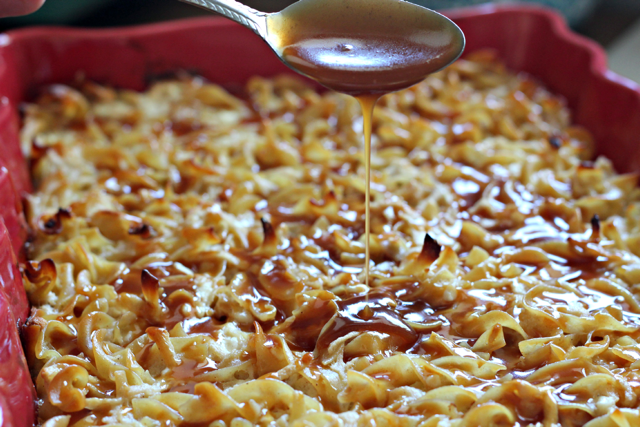 Once kugel is done, drizzle with caramel sauce and let stand at least 5-10 minutes before serving. Serve warm. Best served right after cooking. If you need to cook ahead of time, drizzle caramel right before serving. You can make the caramel ahead of time (up to 1 week), refrigerate, and reheat on the stovetop or microwave for just a few seconds before drizzling. Well maybe I should make this to snag myself an eligible single man! Ha! Looks delicious, Amy! Ha thanks, Liz! It’s foolproof! I think I’ll start the “mediterranean” next week………Looks sinful—-Do I have to add this to my “Tashlick” ceremony? 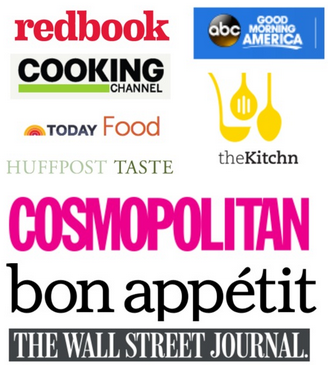 L’Shanna Tova,Lizzy…THANKS and have a FAB and delicious 5775! Ha enjoy it!! 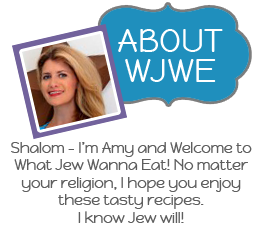 Shana Tova, Lizzy! Amy, does this really need two hours start to finish? It bakes for an hour and prep says 30 minutes. What am I missing? Oh yeah, just an hour to bake! Turned out great and I slipped some shredded zucchini in there (because I have ALL the zucchini…). Really great kugel. And oh too bad I have a double batch of the caramel because I put in too much cream. Oh darn…just have to eat it! Ha great idea with the zucchini! !